On the 20th of July, 1934 triplet sons were born in Bletchley. 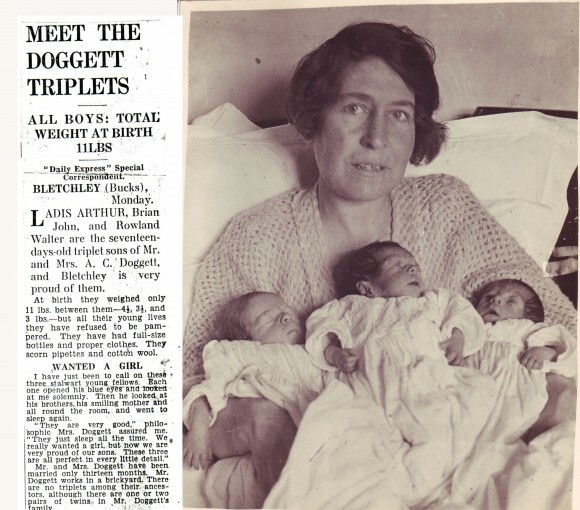 This was a big event in Bletchley as triplets was not that very common an accurance. The boys were all born at home, 28 Eaton Avenue, Bletchley to Eva and Arthur Doggett. Eva was aged 39 and was told that she would may not be able to have children, it was a great shock she said at the time. The total combined weight was 11llbs, Ladas Arthur weighed 4 ½ llb, Brian John 3 1/2llb and Roland Walter 3llb. The local newspapers of the time recorded the event ‘Bletchley’s ‘’THREE MUSKETEERS’’ and national newspapers also announced the event. Eva and Arthur Doggett both met in India , Arthur Serving in the British Army and Eva a Children’s Nurse, they married in Waterbeach, Cambridgeshire , before they moved to Bletchley, where Arthur found a job in the brickyards locally and they bought a newly built house in Eaton Avenue. 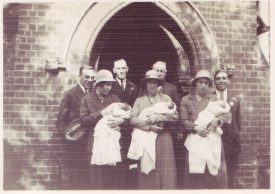 All Triplets were christened on the 9th September, 1934 at St Martin’s Church, Fenny Stratford, lots of family and friends attended this event and the family Doctor was godparent to Roland, as he was named after him, due to not having enough names picked. All triplets over the months thrived with love and care and lots of help from family, friends and neighbours. One triplet Brian tragically died after he was 11 weeks old he was Roland’s identical twin. Ladas and Roland both went to Bletchley Road school and joined the local scouts and later became members of North Bucks Motor Club and North Bucks Cycle Club etc in Bletchley. In WW2 Arthur enlisted and became a Army training officer in Bedford Barracks, where the family moved for a short time, later in the war, Eva and Arthur had lodgers who worked at Bletchley Park. But like everything in them days, it was not known until much later what they did there. Ladas went to Grammar School later and then joined the GPO (Now BT) and later married Dorothy and they moved a few years later to near Ipswich, Suffolk. Roland started an apprenticeship in 1949 at Tompkins Moss Garage and later worked at Sandall Precision,High Precision Equipment and Filtrona . Engineering started his life love of Motorcycles and over the years he has spent time Track racing and enjoying all things motorbikes. Roland Married in July, 1959 to Sheila locally from Cranfield, Beds. They had 4 Children who all still live locally with their families. Both Twins, Ladas and Roland will celebrate their 80th Birthdays in July, 2014. I never knew Uncle Roly was a triplet! The things we never know about our families until this sort of page pops up. I know Roly Doggett ,he is a really nice bloke he is still into his motorcycles and rides still! He has a small clan if other similar aged friends including Ray Thurston and Roy Stockholm.great bunch of knowledgeable enthusiasts of the motorcycling world. WOW I was so excited when I found this article on the internet! Eva Doggett (nee Haylock) was my husband’s great auntie. Two of Eva’s brothers Donovan & Ladas both migrated to Australia in their late teens/early twenties and all I knew about her was that she married Arthur Doggett and had triplets. My husband is a grandson of Donovan Courtney Haylock. Eva & Arthur visited here(Kin Kin) sometime later in life.